Starting tonight, you can catch a full week of Brazilian cinema at the Festival du Film Brésilien de Montréal (Brazilian Film Festival of Montreal). The films tonight are O contador de Historias (The Storyteller) and Terra Vermelha (Bird Watchers) with French and English subtitles respectively. The program consists of six features (Besouro, Blue Eyes, Elvis & Madona, and Time of Fear in addition to tonight's films) and four documentaries (A Night in 67, Beyond Ipanema, Dzi Croquettes and Diary of a Crisis). Most films are screened twice. All films are in Portuguese with subtitles in either French or English but Dzi Croquettes will be screened in both, French first and then in English at the second screening. This is a larger sister festival to the Brazil Film Fest which took place in Toronto last month from October 21-24. All screenings take place at Cinéma du Parc at 3575 avenue du Parc. Tickets are $11, $8 for students, seniors and on Tuesdays. 7 days screening the Brazilian Way of Life: From November 26th to December 2nd , 2010. As it does every year, the Brazilian Film Festival of Montreal takes its audience on a discovery of the best of Brazilian cinema with a panel of films that have received awards from the most prestigious international festivals. In this fourth edition, we invite you on a unique journey to visit this exotic country and experience Brazilian culture. For over four years, the Brazilian Film Festival of Montreal has opened its doors to audiences of all ages, it's main purpose, to promote Brazilian culture. 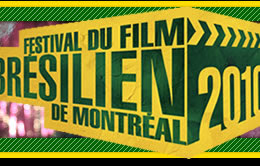 Each year, the success of the Brazilian Film Festival of Montreal has been recognized through the warm audience reception, the support of the city of Montreal, and the participation of many collaborators. All reasons for which the Festival returns every year with an increasingly diverse program and the willingness to satisfy the public more than ever. If you love martial arts, then you'll see the film Besouro, which tells the story of one of the greatest Capoeiristas of all time who became a legend. On a more suspenseful tone, watch Blue Eyes, a film that takes place behind the office doors of a Chief Immigration Officer at a major US airport, where the destinies of a group of Latin American travelers lie in his hands. Based on real events, Time of Fear tells of a revolution about to take place within a prison. On a lighter note, Elvis & Madona, allows you to experience the unlikely love story, set in Copacabana, between a lesbian and a transvestite. The Storyteller, starring Maria de Medeiros, is based on the true story of a young child from the streets who under her character's care becomes a storyteller. We also offer you the opportunity to attend the screening of the documentary Diary of a Crisis that follows the lives of five people living in New York who face all kinds of changes and challenges due to the economic crisis that struck in September 2008.